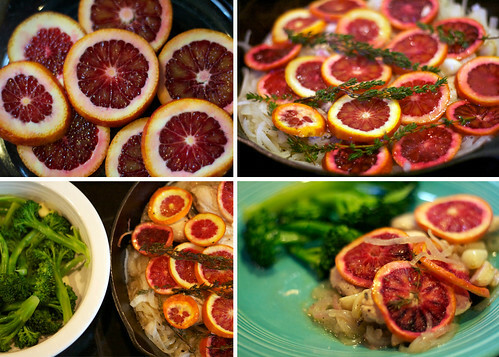 Cooking with Lady Smokey: Spring Is Coming! 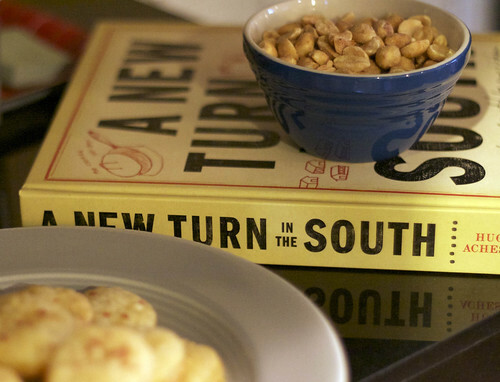 After a few winter months hibernating, our A New Turn In The South cookbook club decided it was about time to eat together again. Having celebrated this cookbook together over three or four dinner parties so far, we still have some recipes to try. My husband Grant, however, really wanted to make his special smoked ribs so our cookbook party took on a few new turns as he decided to go all rogue. He only makes these a couple times a year but he has this recipe nailed. I don’t think I’ve ever shared it before but with grilling season sneaking up on us, it seemed a good time. Rub rack of ribs liberally with dry rub and let sit from 3-24 hours before smoking. 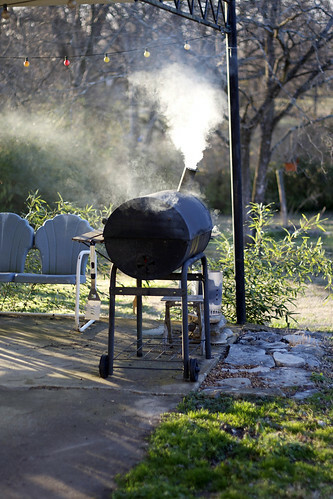 Smoke on a charcoal or gas grill using indirect heat and soaked hickory chips. Smoke for 2 hours turning every half hour.Try to keep your grill thermometer at 225-275 degrees. Make sauce while ribs are smoking. Melt the butter in a saucepan over medium heat, add vinegar and blend. Add all ingredients and simmer on low until the guava paste is melted and mixed into sauce. Leave stove on simmer until ready to baste ribs. Let cool for 5 – 10 minutes and serve. Grant likes to cut them in three rib chunks to serve! To accompany the ribs, we had a whole mess of other dishes from the cookbook that everyone brought. We ended up having several little courses. We started with several delicious cheeses from The Bloomy Rind and Porter Road’s Chicken Rillette which we enjoyed with some homemade pickles, homemade fig jam, and Pimm’s Cups. Next we had the Roasted Cauliflower Soup. That was followed by the Ribs with Collards and then Brunswick Stew with Corn Bread. Good thing we followed up the next few weeks with lots of salads! 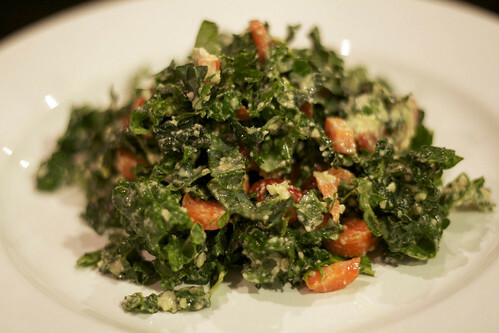 I came up with this super easy dressing that worked well over raw kale tossed with chopped carrots and cherry tomatoes but also was delicious over brown rice with sauteed or steamed vegetables. Blend all ingredients in a food processor or blender. Viola! Pour over vegetables or toss in a salad. Combine all ingredients except shallot in a blender, and blend. A creamy emulsion will form within 30 seconds. Taste, and add more vinegar if necessary, about a teaspoon at a time, until the balance tastes right. Add shallot, and turn machine on and off a few times, until shallot is minced within the dressing. Taste, adjust seasoning and serve. And speaking of the colorful vegetables, we’ve been eating a ton of beautiful beets! My favorite current way has been to saute them in an iron skillet with a little butter, salt, pepper, and Italian herbs and then toss with blood orange segments and currants. Those blood oranges are so dang pretty that I couldn’t stop thinking about them. 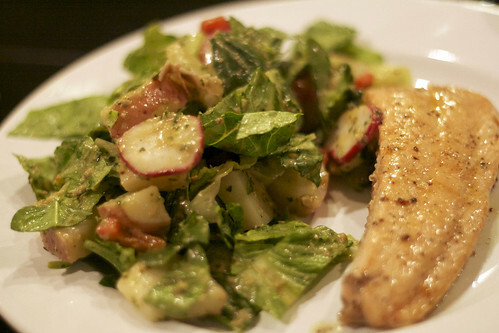 I came up with this chicken dish which was beautiful, simple and quite delicious. It is really nice to see so many colors on our plate in the middle of winter. Preheat oven to 375. Heat an iron skillet on the stove at medium heat. Add olive oil and butter. Add onions and saute until then begin to soften. Add the chicken and garlic and brown for a few minutes on each side. Add the fresh thyme, orange slices, and liquid. Bake in the oven for 15-20 minutes until chicken is done. Also a nice explosion of color in the midst of the winter blahs was Daniel Romano’s amazing country and western embroidered suit! 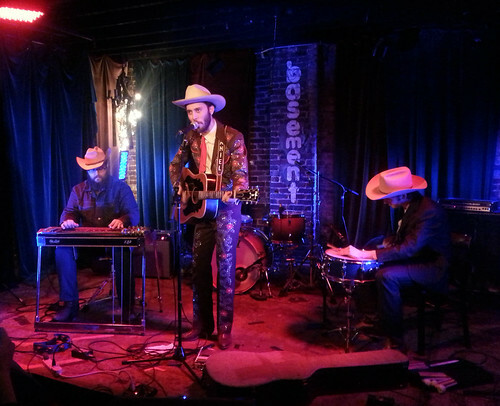 This Canadian songbird was touring through the South a few weeks back and we were lucky to catch his show at the Basement. He writes some great songs and this fella can sing. He was accompanied by his brother on snare drum and a pedal steel player who also sang, accompanying Daniel on a great Louvin Brothers’ tune. You can buy his new album and see another view of that awesome sparkly suit here. Happy Eating! And don’t forget to go see some live music. It’s good for your soul.